While participants of the trending ponzi scheme, Ultimate Cycler patiently await the launch of the phase 2 server that will enable them register new members, some fraudsters have decided to take advantage of such endless wait by cloning the Ultimate Cycler website. This 'cloned' website is initiated by fraudsters with the intention of getting your original ultimate cycler account details. 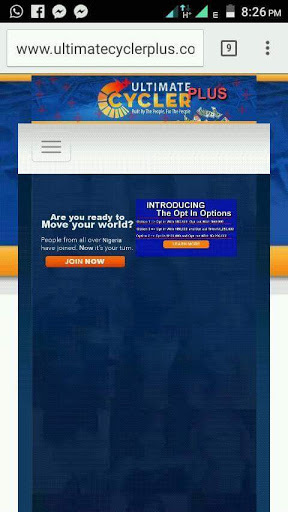 Please don't visit the site let alone logging in! Let's anticipate the epic launch of our one and only Ultimate Cycler tomorrow! In other words, the phase 2 server will be launched tomorrow so as to enable new sign ups. Below is an image of the 'cloned' website. Please don't be a victim! I will keep you updated.